We first met the parents of Nicholas and Reagan six years ago, when Rick made their three foot tall wedding cake and a surprise groom's cake. 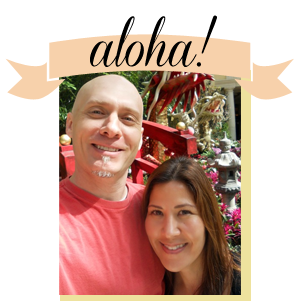 The couple returned to us for birthday celebrations, always bringing us fun, sometimes crazy, themes along the way - like a sculpted Palmolive bottle cake! They adore cake - the taste of it as much as the appearance - and we always look forward to making their special cakes! 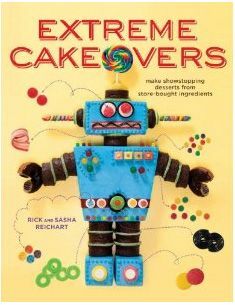 When they started having children, Rick began making cakes for Nicholas and Reagan who, for the past couple of years, have celebrated birthdays together. Last year, Rick made them each their own cake. 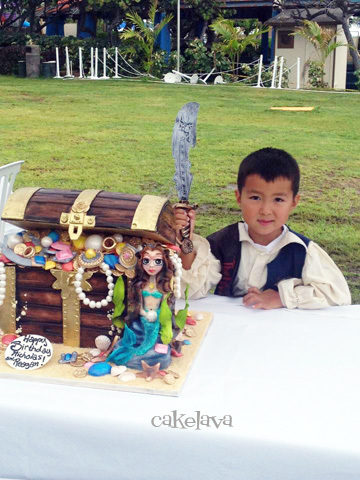 This year their interests were combined into one cake with a Pirate and Mermaid theme, represented by a treasure chest filled with jewels with a pretty mermaid on the side. It was so much fun to do and we were excited about it as soon as the order was placed! and FILL their treasure chest until it was overflowing with pretty, all edible jewels. 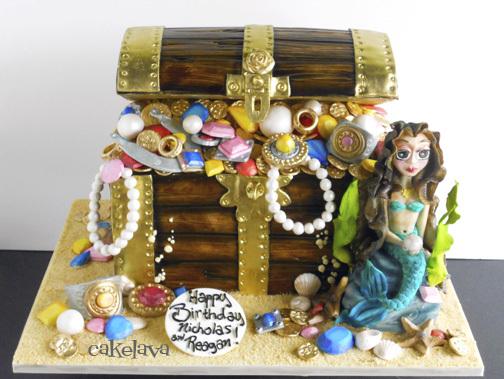 He started working on their cake days in advance, first making and painting the mermaid then making the jewels and sculpting the treasure chest. The treasure chest was sculpted out of vanilla cake and had a delicious caramel cream filling. Rick estimates 15 hours was spent making the cake, and once again, his work area and hands looked like a color explosion had occurred! After the party was over, our clients sent us an adorable photo of their son Nicholas, in his Pirate costume holding a sword. This little cutie captured our hearts and made all the hard work and time spent on the cake completely worth it. Happy Birthday to Nicholas and Reagan! We hope to see them and their family again next year! Happy Birthday, Ernie Santiago, Mr. U.S.A. 1983!